In late December 1991, an accidental release of 5,700 CI of tritiated water (HTO) from the Savannah River Site was transported via site streams into the Savannah River where it was carried downstream to the coastal zone. HTO released into a semitropical Georgia estuary was forced into the tidal marshes surrounding the estuary as well as discharged directly into the Atlantic Ocean. The spreading of HTO was studied with a 3D hydrodynamic model (ALGE) that includes flooding and draining of intertidal areas. Comparisons of model simulations to measured HTO concentration showed that ALGE simulated well the general increase and decrease of HTO as its plume passed a given area. The “sheet flow” approximation for marsh and small tidal creek flow largely compensated for lack of model resolution and accurate bathymetry in areas with numerous small to medium-sized tidal creeks. The water volume of the unresolved tidal creeks had to be accounted for in the simulations by increasing the initial water depth over the marshes. ALGE and a simple box model both reproduced the trapping of HTO in intertidal areas. The time scale over which intertidal areas import and export HTO back to the tidal channels varies between 10 and 30 days. There were many people too numerous to specifically mention who were responsible for the success of the HTO sampling project at the time following the 1991 release. Among the many, we wish to single out a few of the people and agencies who made indispensable contributions to this study. The able crew of the R/V BLUE FIN of the Skidaway Institute of Oceanography and the R/V SEA DAWG of the University of Georgia Marine Extension gave us dedicated enthusiasm and support in the carrying out of the sampling work offshore and in the navigable waterways and estuaries. Particular thanks go to James Gault, Jay Fripp, and Jim Whitted. We also acknowledge the valuable assistance of the following agencies and their representatives who provided the resources, dedication, and perseverance day and night in obtaining the data reported here: Cliff Blackman, Jim Hardeman, and Duane Harris at GA Department of Natural Resources, Professor Matt Gilligan and students from Savannah State University, Personnel at South Carolina DNR, Professor Jim Alberts, past Director of the University of GA Marine Science Institute, Sapelo Is, GA, Dee King, Clark Alexander, Russ Bulluck, and Barbara Blanton at Skidaway Institute of Oceanography. Donna Beals, Jim Cadieux, Phil Bowman, Ron Johnson, and many other people at Savannah River National Laboratory helped collect and analyze the hundreds of tritium samples that were discussed in this paper. We gratefully acknowledge the following agencies that supported the work described in this paper: the Georgia Coastal Zone Management Program (Grant No. RR100-279/9262764), National Science Foundation LTER (Grant No. OCE-9982133), and the Department of Energy (Contract No. DE-AC09-96SR18500). Details are presented here on the manner in which ALGE handles the wetting and drying of intertidal areas. A node dries out when the water depth drops below 2 cm. Mass is conserved when drying occurs by moving the small amount of water and tritium from the node that is drying out to a nearby node that still exceeds the minimum depth requirement. A node rewets when an adjacent already wet node is deeper than 4 cm and the water surface of the wet node is more than 4 cm higher than the elevation of the node that is to be rewetted. Mass is conserved when rewetting occurs by decreasing the amount of water and tritium in the adjacent wet node by the amounts contributed to the node being rewetted. The critical parameter in the Fischer-Antze model (Fischer-Antze et al. 2001) is the grass density, which for these simulations was set equal to 3.0 m2 of grass/m3 of water. The simulations were not sensitive to factor-of-2 variations in the grass density. Current velocities inside the simulated marshes were a few centimeters per second, in agreement with published data. In the parts of the computational domain where there was no marsh grass, the only drag term was the bottom friction, which used a roughness length of 0.001 m.
The ALGE code uses a version of the Level 2.5 turbulence closure model described by Mellor and Yamada (1982). This version described by Yamada (1983) was slightly modified by Garrett (Garrett 1983; Garrett and Hayes 1997) to adapt the Level 2.5 scheme to a shallow water body, where the vertical turbulent length scale is limited by the presence of a solid boundary at the bottom and a free surface at the air–water interface. The principal modification by Garrett was the addition of the constraint that the vertical turbulent length scale must be less than or equal to the vertical resolution of the computational mesh. For the HTO simulation described in this paper, the authors found that reducing the vertical turbulent length scale from the 1 m vertical resolution of the computational domain to 1 cm produced the best agreement between simulated and measured salinity profiles. The authors have found that other stably stratified bodies of water, such as power plant cooling lakes, also must be simulated using very small vertical turbulent length scales in order to reproduce the observed thermodynamics and dynamics of the cooling lake. The upper limit of 1 cm for the maximum vertical turbulent length scale was imposed at all nodes for the entire HTO simulation. This constraint improved the simulation in all areas, not just in the Savannah River, implying that there was significant vertical stratification even in tidal creeks well away from the river. Figure 17 compares computed salinity profiles taken from different days of the 151-day simulation of the 1991 tritium release to profiles measured in the Savannah River on various days in 1992 and 1995 (Skidaway Institute of Oceanography 1993 and unpublished data). Salinity profiles were not measured as a part of the data collections during the 1991 tritium release, but the profiles (Fig. 17) indicate that vertical mixing of salty and fresh water was being modeled correctly in the simulation. Figure 18 presents the corresponding simulated HTO profiles for the same 5 days of the simulation. The shapes of the HTO concentration profiles mirror the salinity profiles with the highest concentrations in the lower salinity water near the surface. The 5 days selected also illustrate the passage of the peak of the HTO plume, with a large increase in concentration from Days 32 to 34, then a rapid decrease by Day 44 and a return to background concentrations of about 0.5 pCi/ml by Day 74. Some of the variability in the vertical tritium concentration gradient (Fig. 18) is attributed to the time in the tidal cycle, since the profiles shown were all taken from the same hour of the day (00 Greenwich Mean Time). 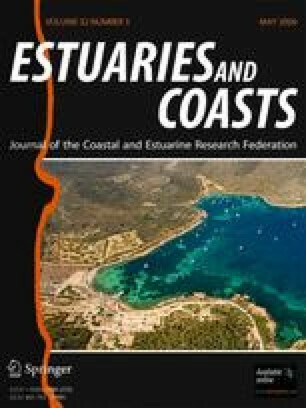 Profiles that were taken during ebb tides exhibit stronger vertical gradients in salinity and tritium, whereas those taken during flood tides have weaker gradients expected in partially mixed estuaries (Simpson et al. 1990). The same variability in gradient can be seen in the measured salinity profiles (Fig. 17) taken during flood and ebb tides. With mesh size limited to 300 m, a scheme is required to account for the missing creeks that flood and drain the intertidal area. The required morphological detail of the HTO release area is lacking, so another tidal-creek system was examined where this detail is available. The Duplin River, which is representative of the Savannah River study area, shows how much of the total tidal prism is in the tidal creeks versus the marsh (Blanton et al. 2007). In plots of water volume as a function of tidal height (Fig. 19), note that about three fourths of the total water volume is present in the system at the point in a rising tide when water flows out of the creeks and into the marshes. That point is clearly identified (Fig. 19) by the sudden change in slope of the area curve from nearly vertical to nearly horizontal. Beyond that inflection point in the area curve, the additional volume is about two million cubic meters, or about one fourth of the total volume. In contrast, the area flooded rises from four million to 12 million square meters. Since the Duplin River is just over 200 m wide at its mouth, this entire tidal creek–marsh system would not be resolved in the 300-m resolution computational domain used in the ALGE simulations. The amount of water lost due to lack of resolution is greater than six million cubic meters, because water present in the Duplin River and its larger branches at low tide is not accounted for in Fig. 19. Since all of the creeks in the Duplin River system would not have been represented in the 300-m resolution ALGE simulation, all of that additional water had to be accounted for in similar systems that were part of the ALGE computational domain. Additional water depth data in the Duplin River indicate a mean low-water depth of 3.1 m. The additional water mass of 5.6 million cubic meters accounts for the volume not included in Fig. 19. The total volume is 13.6 million cubic meters for the entire Duplin River system at high tide. Given the total area of 12 million square meters, this gives an average depth of 1.13 m. Since the ALGE simulation did not resolve any tidal creek with a width of less than 300 m, then the initial marsh depth in the ALGE simulation had to be increased to produce the correct water volume at high tide. At its mouth, the Duplin River is about 210 m wide, so even larger tidal creeks than the Duplin River were not resolved in the ALGE computational domain. The ALGE simulations started with an average water depth of 1.59 m for the nodes designated as marsh. The difference between 1.13 and 1.59 m is, at least, partly explained by the difference between the 210-m maximum width of the Duplin River and the 300-m ALGE nodal spacing, i.e., in the HTO simulation tidal creeks as wide as 300 m were treated as marsh and that additional mass had to be accounted for.